These pretty bedsides come in a pair and form part of our Lila Range. Painted in a clean, crisp white that will easily suit any colour scheme. 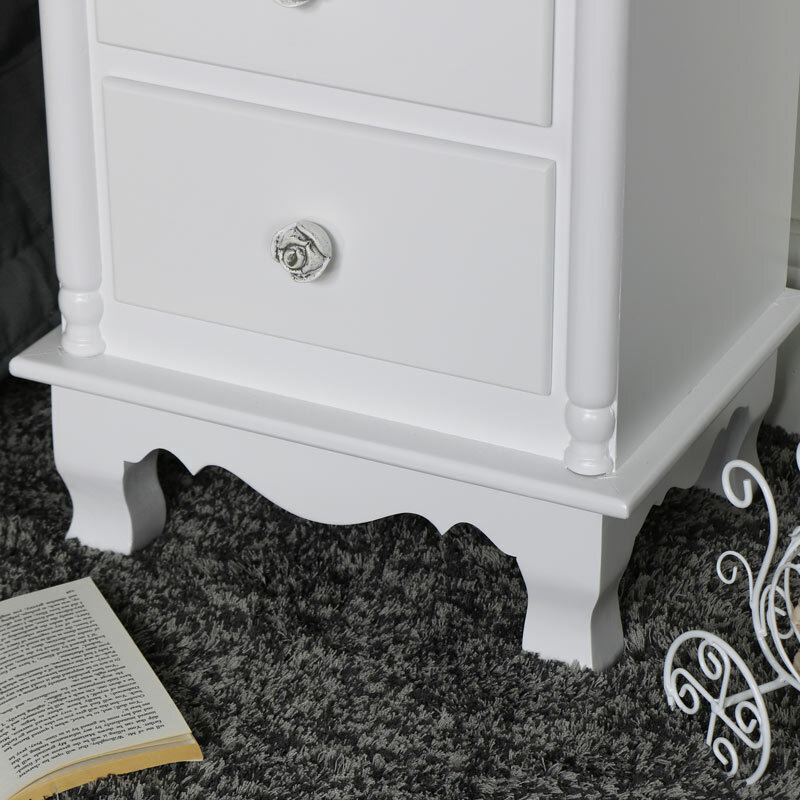 A great storage solution for you bedroom that will add some vintage French inspiration. Charming and beautiful, these bedsides will be simply perfect for sitting at each side of the bed. Just what you need for holding a bedside lamp with the 3 drawers offering plenty of storage for chargers and knick-knacks. 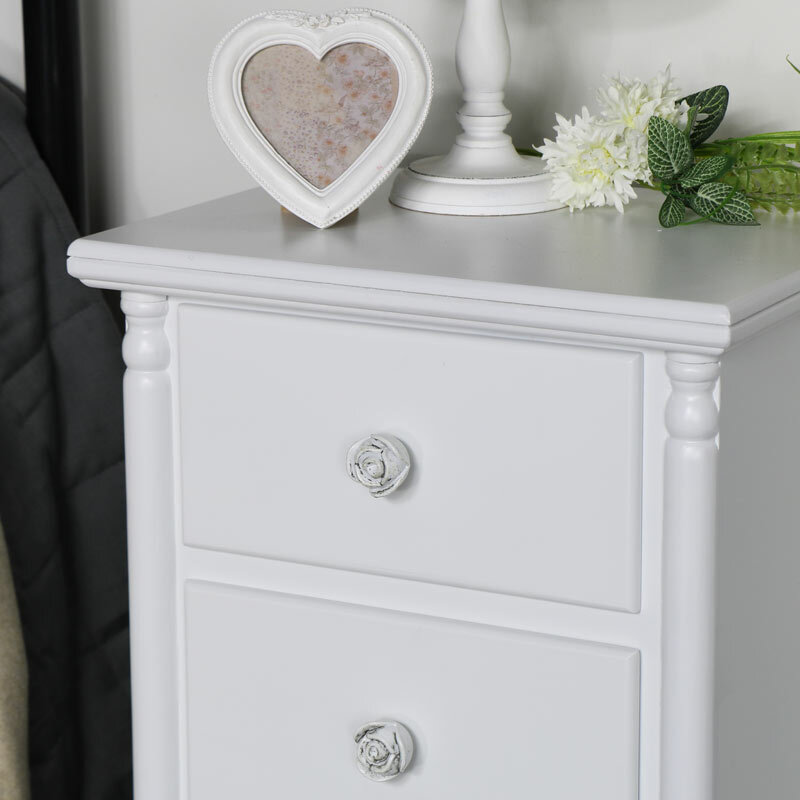 The chests make the perfect bedside set with both featuring rose carved drawer knobs and curved legs. We have even more furniture in our Lila Range that will help you to create your dream bedroom set up. Great storage and fashionable style with a dressing table, wardrobe and bedside chest to make your room complete. These pretty bedsides come in a pair and form part of our Lila Range. Painted in a clean, crisp white that will easily suit any colour scheme. A great storage solution for you bedroom that will add some vintage French inspiration. Charming and beautiful, these bedsides will be simply perfect for sitting at each side of the bed. Just what you need for holding a bedside lamp with the 3 drawers offering plenty of storage for chargers and knick-knacks. 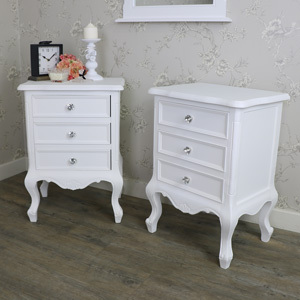 The chests make the perfect bedside set with both featuring rose carved drawer knobs and curved legs. We have even more furniture in our Lila Range that will help you to create your dream bedroom set up. Great storage and fashionable style with a dressing table, wardrobe and bedside chest to make your room complete. Made from wood and painted in white. The inside storage on the drawers each measure 22cm x 9.5cm x 23cm (width x height x depth). The bedside chest comes fully assembled. 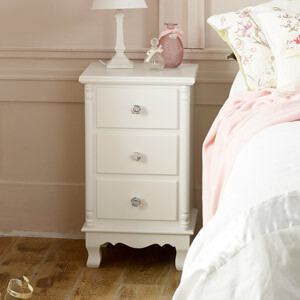 If 2 is too many with this bedside chest, we also have it available singly. 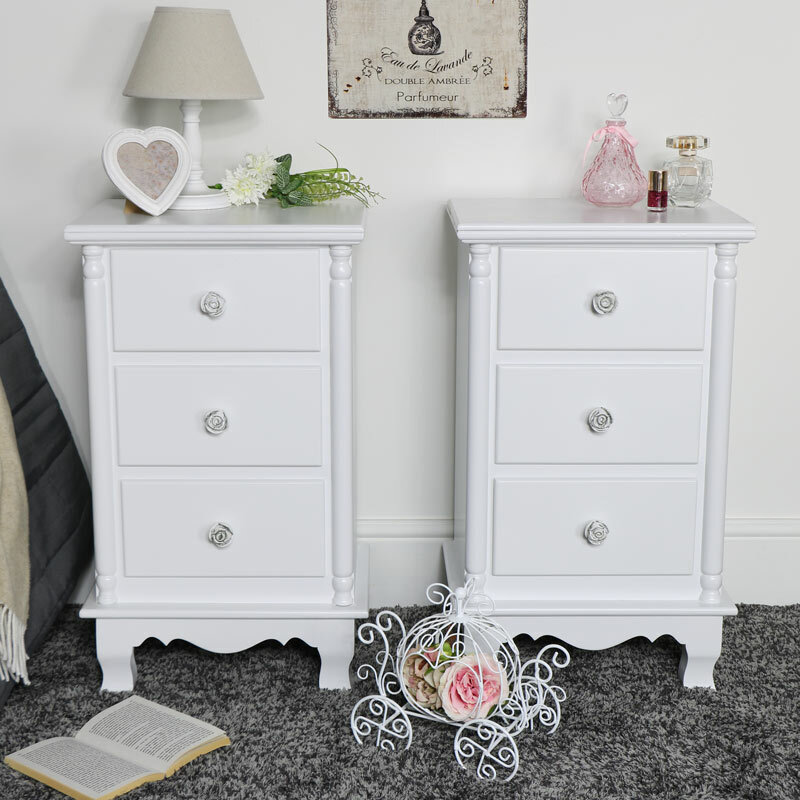 We also have several more pieces of furniture available in this range that will allow you to fully furnish your bedroom and add a fresh new look to your home.